Ep.118 Ch.55 "Of Jackals and Jesters"
In this episode, Gregory Brewko reacts to Nigel's confession about shooting Dominique Fessler. Meanwhile, Connie and Shade chat while Shade looks over a map of the fractured United States in the Ghost Train's caboose. As Percy practices his quick draw, Gregory pulls the brake. 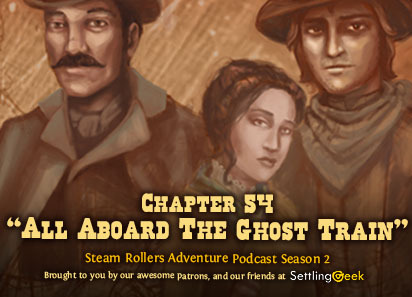 Ep.117 Ch.54 "All Aboard The Ghost Train"
We return to the dark and gloomy Rouche's Restaurant as Connie, Percy, Nigel, and Fifi (joined by Gregory Brewko and Shade, the witch) find themselves being hunted by an unseen stalker. The approaching darkness weighs heavily on Connie and Shade, but will they find an escape in Brewko's Magic Kiosk? Ep.116 Ch.53 "The Tesla Net"
As Oliver Glass tries to gain control of the airship Maria, rending the controls from the grasp of the Second Story Club hijackers, Silas Monroe sets out in search of Oliver and the kids. 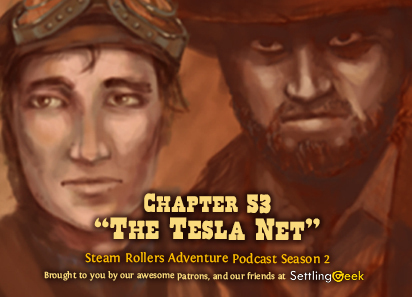 As one of them makes a very dark discovery, the airship comes in contact with The Tesla Net! 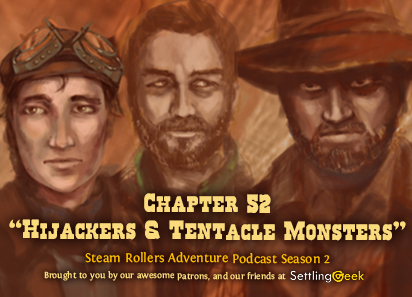 Ep.115 Ch.52 "Hijackers and Tentacle Monsters"
We continue with our heroes, Connie, Percy, and Nigel, along with mysterious cogman Gregory Brewko, hiding out in Rouche's abandoned restaurant. As the gentlemen (and dog) begin to realize the sounds they've been hearing are phantoms, the invisible stranger reveals herself to Connie.